Is frailty a key trigger for trout? Sometime back I published a post “The Cuckoo and the Trout” based on the genetic considerations of “super stimuli” as discussed in Richard Dawkin’s exceptional book “The selfish Gene”.. The basic premise being that some stimuli override other considerations such that in this instance a tiny parent wren “ignores” the obvious fact that its parasitical baby is far larger than makes sense. I think that the concept that some stimuli override other considerations might go a long way to explain some of the rather perverse considerations of fly tying and fly fishing. Why would a trout ignore the hook sticking out of a fly or the tippet tied to its head? And why would it make sense to make close copy imitations of bugs when we all know too well that the best efforts are going to be let down by these necessary limitations of design? Certainly I know anglers from the States who claim that the bodies of their PMD’s need to be a little more red on the upper reaches of a particular stream and a little more yellow lower down. They will swear on the Bible this is true and I have no reason to doubt their assertions, but surely it is daft to consider such a minor variation of import when the trout can easily see the hook sticking out of the imitation. For animals, including ourselves, to operate in a complex and ever changing world we cannot in reality assess every possible piece of information available before making a decision, and for a predator, such as a trout, the window of opportunity to make a decision as to “eat it or not eat it” is limited before the potential prey item has been whisked away by the current or flies out of reach. In reality then one need not actually undertake any cognitive gymnastics to be able to come up with a quick strategy in terms of assessing information. General rules which hold true most of the time will suffice. A Lion on the plains of the Serengetti, need not consider why a particular Wildebeest is slow or limping, it only need recognize that a slow or limping prey animal is a better bet requiring less effort and smaller risk in terms its capture. So I would suggest much the same holds true for trout in a stream. Firstly we all recognize that it is on average much easier to deceive fish in faster flowing currents, they have less time to make the decision; I would suggest that every fly angler across the world recognizes this simple truth. I would then further hypothesize that the less time available the more one relies on key information. In this, admittedly arbitrary, diagram below, the idea is that of all the possible clues to the validity of selecting a potential food item as real some will take precedence depending on the amount of time available. i.e. Faster currents allow for less time. Not to mention previous positive and negative experiences of the fish. 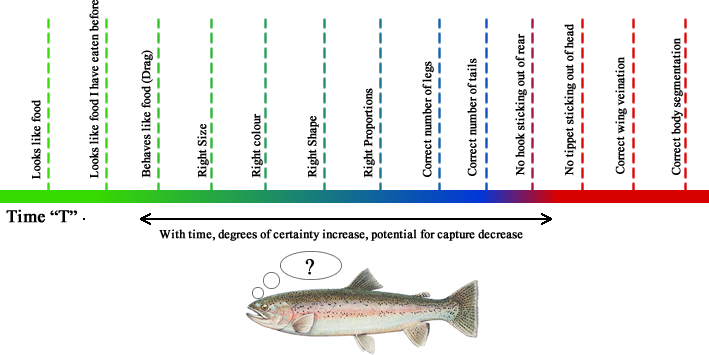 Of all the possible considerations in assessing potential food items how many does a fish actually use and is it possible to induce a shortcut? If this were true one would expect that the faster the water the less specific one’s imitation would have to be and even the less important the presentation, this would seem to be borne out by much on stream experience. So what if one could “beat the system”? What if even when the fish had all the time in the world we could find a way to shortcut the selection process and increase our chances of deception? Obviously one might expect that plenty of other factors , some of which we can’t imagine are potentially at play. To hypothesize further then, one might expect that the more hungry the fish the more likely it would be to make an erroneous snap decision. Equally where there is a massive opportunity of lots of food in a short time, (The classic duffer’s fortnight of Ephemera Danica on the English Chalkstreams for example), the fish may be rather more “Gung-Ho” than normal. It is perhaps equally worthy of consideration that most of the time in nature an erroneous assessment isn’t overly problematic to the fish, a waste of a little energy and spit out the offending item. It is only the machinations of the angler which make an erroneous selection potentially fatal or at best inconvenient. It strikes me that one of the significant triggers to predatory behavior is apparent vulnerability, the lions on the Serengetti sitting about under a tree, chilling in the afternoon sun; but should a limping Wildebeest wander past the whole game changes and predatory instincts kick in. The pack is on the hunt, keyed into the possibility of easy prey. I would suggest that using the same logic it is possible, at least some of the time, to trigger that response in fish with the arrival of an apparently easily captured food item. In a human context perhaps much the same applies when hunting (read shopping in the modern world). Yes you can research the presence of GMOs in your food, the number of calories, whether it is halal slaughtered, the sell by date and much more information all of which is readily available. But do you? And more to the point even if you are more than averagely pedantic can the offer of a bargain,” two for the price of one”,” 10% off” etc shortcut your normally extensive analysis? I would suggest that it can and that the marketing departments of most food companies fully understand that. What would happen to our supposed decision time-line were we to add in some super stimulus, the piscatorial equivalent of “A Bargain”? Such as apparent vulnerability? After all to a predator, an easy meal is in effect a bargain, less costly in terms of effort and risk, could that result in the bypassing of normal selectivity? Is it not likely that with the bonus of apparently “easy prey” the decision making process could be short cut, a snap decision induced in the fish? Could the trigger of an apparently easy meal short-cut the process of selection and result in more effective fly pattern? In a recently observed example I was guiding a couple and the one angler had opportunity to cast over a clearly visible fish, not feeding overly actively but quietly taking the odd nymph or surface fly. This all in slow moving clear water (The worst case scenario for an angler in general). Casting small dries, nymphs and even more weighted nymphs elicited no response and it seemed as though the fish may have become aware of our presence. Then a cast of a diminutive and very simple soft hackle pattern, presented apparently helpless in the film. A non specific morsel that undoubtedly looked a bit worse for wear. The fly landed a fraction to the side and slightly behind the fish, it turned and ate the fly with knee jerk aggression. This after better presentations of far more perfectly constructed flies. Could it be that the “vulnerability” of the pattern was the key? I would suggest that this and other “super stimuli” might equally short cut the decision making process (not for a moment implying that there is any great deal of cognitive behavior on the part of the fish). Most of us would accept that a negative super stimulus, for example drag on a dry fly or a splash on presentation would result in a shortcut, this time a negative selection, so why not a positive shortcut if we get the stimulus right? Add in something that the fish particularly likes, say an Ant pattern. It is well known that trout LOVE ants and their response to ant patterns is frequently nonsensical, they expend more energy and move further to capture an ant pattern than they do other food items, real or fake. Could it be that the super stimulus of a segmented body and recollection of pleasant taste override the normal selection process? It is certainly worth a thought. The ideas discussed here were mostly driven by a desire to consider why should very simple soft hackle patterns be so effective. Soft hackles, North Country Spiders, Emergers, Stillborns and such all lack much in terms of actual imitation but do offer up the illusion of vulnerability and/or chances of escape (in the case of emergers). Could it be that these patterns work as well as they do because they provide a triggered shortcut to the normal food selection process? 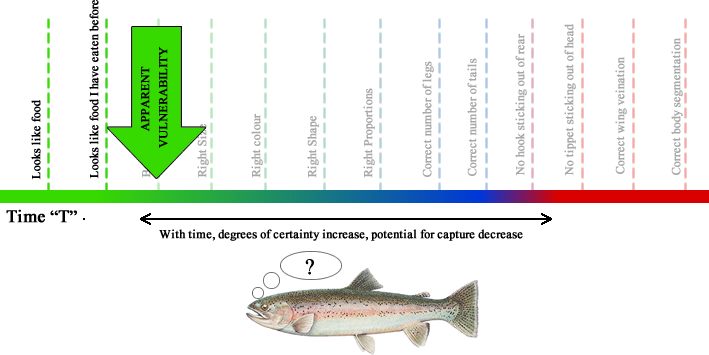 I don’t know what or even if a trout thinks, I do know that they do some things that don’t on the face of it make sense, but I would suggest that viewing their behavior in the light of this hypothesis does potentially offer some explanation. The current is fast and on average the fish are less critical of fly and presentation. (decision process limited by available time). Fish slash and burn energy during rapid emergence of caddis flies… (decision process pre-empted by the lack of time due to potential escape of the prey). Significant hatch of large flies (Ephemera Danica): Increased gain of calories at low effort, repetitive reinforcement of decision making (other flies have been fine to eat), limited time to make the most of the windfall.. short cut decision making and eat as much as possible..
Wild fish in remote spots: On average have never had a negative consequence and as such will eat almost anything. No evolutionary pressure to be more selective. Fish in heavily fished Catch and Release waters, a history of negative consequences for poor decision making. More evolutionary pressure to be increasingly careful, fish more difficult to deceive. The classic, “induced take”. Is the decision making process short-cut through the apparent risk of escape of a food item? The overly large fly, could it be that the promise of very high calorie food easily obtained can circumvent the normal selection process and induce a snap decision from the fish? I think that in all of these examples there is enough subjective evidence to suggest that much of the time this hypothesis holds true and that the angler can use this to become more effective at deceiving his quarry. I would suggest that in most of the cases I can consider the idea that the decision making process is varied and that thinking in these terms many apparently aberrant behaviors could have a logical explanation. It also suggests that “exact copy” fly tying may well be one of the least effective strategies for the angler. Something worth thinking about ? Brought to you by Inkwazi Flyfishing, Cape Towns ONLY dedicated full service trout guiding operation.